Remember the winter days, where you would wake up and get ready for work and dread the moment you had to make the short walk from your front door to your car? The cold, chilly, air nipping at your cheeks and freezing your hands fumbling with the keys and then dropping the Radar Detector under the seat? Or perhaps the very sticky, very hot, summer mornings that leave you aching for the cool air running from your car air conditioner. There is nothing worse than being freezing cold, or burning hot, and having to wait for your heating and cooling system to kick into gear. Well, kiss those days goodbye. Making its debut in the 1980's, remote start keyless entry systems found their way to major markets. However, as technology advances car manufactures introduced more advanced and more user-friendly remote start, key less entry for automobiles. Now, you can start your car from the confines of your home, after making the quick trek to your car, you can enjoy a nice, temperature content car ride! Perhaps you can recall running late to work, or an important meeting, only to not be able to peer through the windshield and you are forced to wait for your window to be defrosted. These days are all a thing of the past. Undoubtedly, one of the most rewarding aspects to the Remote Start Keyless Entry is the ability to start your car from virtually anywhere, as long as the small box equipped inside the vehicle can retrieve a signal from the remote starter. Additionally, the remote offers a high level of security, and can be programed to alert you the moment your car is either hit, or broken into. Imagine knowing something happens,the very moment that it happens. This takes vehicle security to a whole new level. There are a numerous other reasons how a Remote Start Keyless Entry can be beneficial. Aside from the immediate alert in the event that your vehicle security is jeopardized, a Remote Start Keyless Entry can involve remote vehicle operation, defrosting, heating, and two-way communication for vehicle status. How does this piece of technology work? Inside the vehicle is a remote start brain/computer. When the signal is sent from the key fob or smartphone, it activates the system that allows the engine to start along with the heating and cooling system, and additionally locks all the doors to prevent theft; a blinking light or horn signals a visual confirmation that it is working. Once the systems have been activated, the power to control your settings is literally right at your fingertips. Finally, say goodbye to those cold winter mornings and/or hot summer days! Leisurely be able to prep your vehicle to your needs long before climbing in the front seat! As technology advances, so does the ease of being able to start your car using a key fob or smartphone. Starting your car from a remote location just got easier. 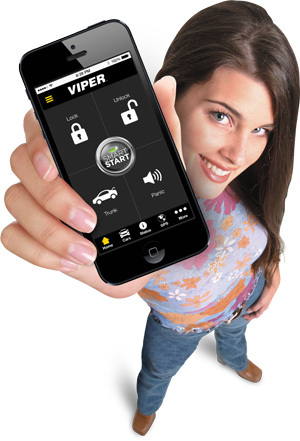 If your car is installed and programmed with a remote start system, you can now download an application for you BlackBerry, iPhone, or Android smartphone that will additionally start your car with the ease of pushing a single button.